WAM’s Birthday is on Saturday. Expect an extra update to celebrate. Most likely a Pin-Up of some sort. 1. Mordred is in a mood to humor Wiglaf’s inquisitiveness in panels 1 and 2. 3. 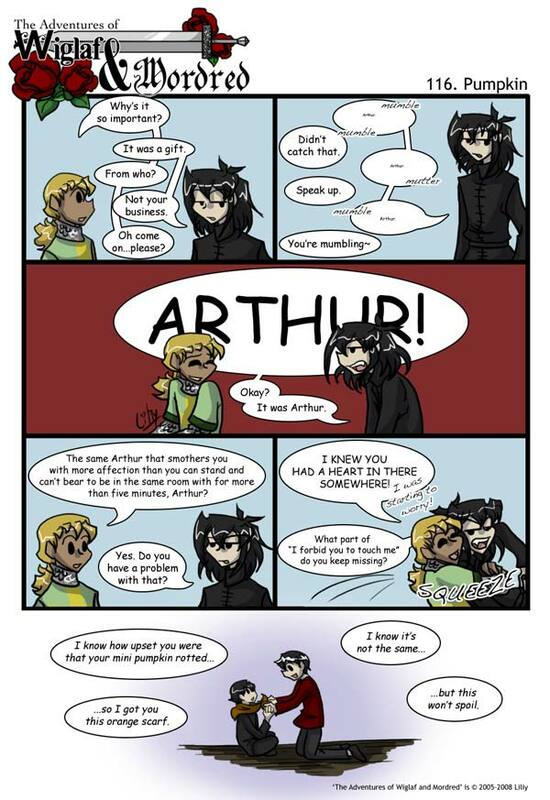 Wiglaf’s perfect encapsulation of Mordred’s familial relationship with Arthur in panel 4. 4. Panel 5′s dialogue exchange! 5. The “Aww, Christmas card” quality of panel 6. 6. The two sentence story in panel 6. Hmm… Janus hates being outdone by Arthur. I wonder what she tried to give Mordred. It was probably something overblown that Mordred hated and fled at first opportunity. !!! That’s a new possibility I hadn’t considered for the reasons behind comic 115. Hmm. Beautiful work on this comic, Liliy. It’s just perfect in so many ways. Happy Birthday, WAM/TAWM! How many years have you been at this, now, Liliy? Thanks. It happens when I feel supremely happy about something. Janus did indeed give Mordred something, too (That he also wears all the time). :D Scarf from Arthur, set of rings from Janus. And the only sign he cares about his zealous siblings at all. Mwa ha ha ha ha. Wiglaf’s grin in panel 3 is a nice touch, and all his different amiable expressions contrast nicely with all of Mordred’s looks of exasperation. Driver needs some breast enhancement BADLY! His scarf is the same color as pumpkins. And when I think ‘pumpkin’ I go straight to ‘mini-pumpkin’. Of which I adore. I know he he it’s hard to believe he loved a mini pumpkin. but that’s so sweet. I do believe it is the ‘I forbid you to’ that goes missing…but aw! hug time! and why is it that everytime Wiglaf hugs Mordred he freaks at some point? Awwwww, I love that last panel!